Earlier, I made a high profile case for the UT47.2. 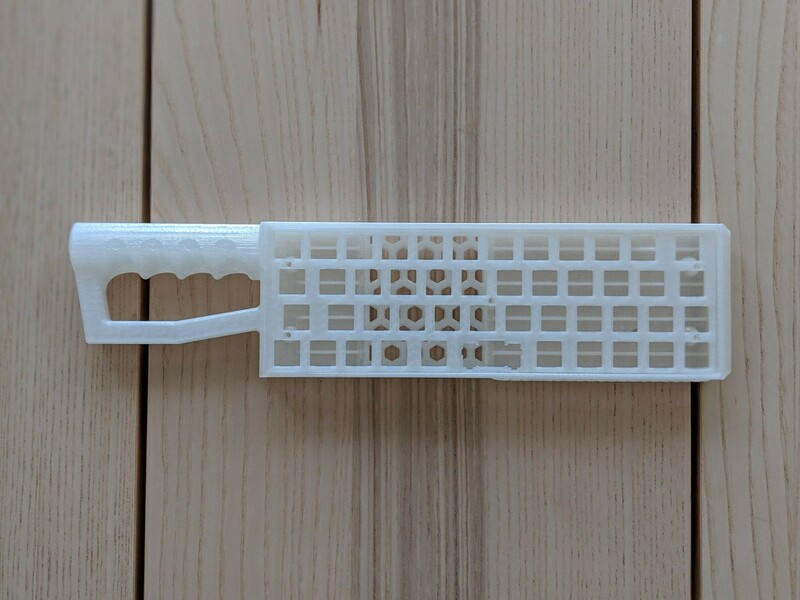 On Keyhive’s request, I made two other cases: A low profile case, and a sword-style case, inspired by Qlavier’s Keeblade. In this post, I’ll highlight some of the features that made it into the case. 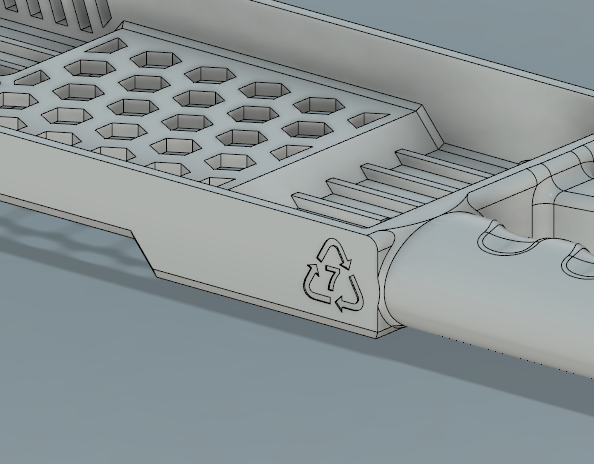 This case was intended to look much like a sword, but I took some liberties with the design. I had given the material a white color while designing the handle, and it reminded me a bit of NASA’s space equipment, so I went on to try and give it a futuristic vibe. A render of the Keyblade case. The case contains several features that are purely for aesthetics: the stylized handle, air vents, a hex-grid bottom duct and the name of the keyboard printed at the front: UT47.2. The grooved handle has smooth edges and is contoured for a better grip. A so-called guard is present to make it look like a sword instead of a meat cleaver, and the sharp angles make it look industrial. A peek inside the Keeblade case. Several open features allow the LED lighting to shine through and cast interesting shadows when you opt for an opaque case. As you’ll see later on, transparent plastic lets the lighting shine through. A hexagonal grid is raised above the ground level to provide some kind of bridge. Air vents on the front and the side allow yet more light to shine through. A chamfer at the inside edge of the case and several ridges spanning across the width of the case should provide better structural integrity, if the owner finds him- or herself swinging the case around. Since the case is printed flat, the print lines run along the width as well, further distributing the forces swinging the case would bring. The case is recyclable, though the PLA used is marked as “Other”. I thought it’d be fun to apply a “Recycle” icon on the back of the case. The text isn’t too visible on the printed versions since the text isn’t recessed deeply, but a little ink or paint can make the feature more apparent. 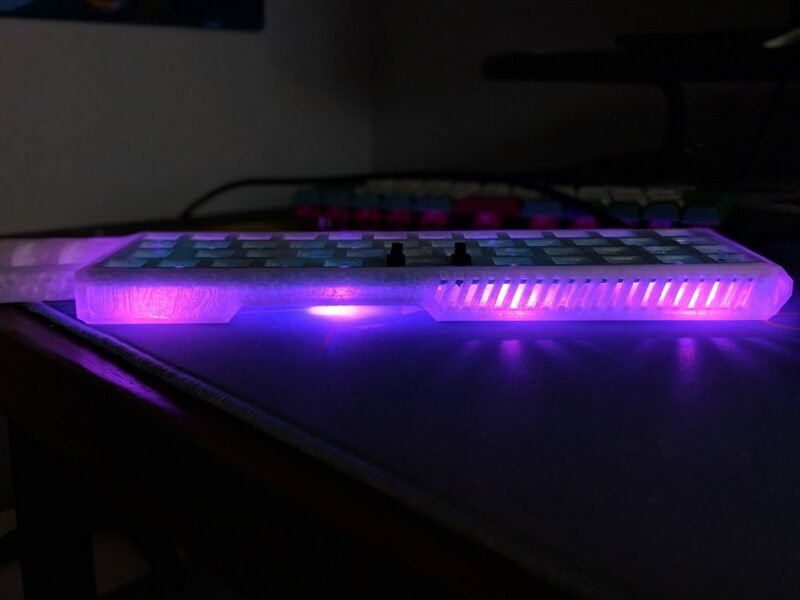 The underglow LEDs of the keyboard shining through the case at full brightness. Printed in transparent PLA, the LED lights shine through the case, being diffused at most points. I think an opaque variant would highlight the features more subtly, it’s a matter of preference. The group buy has come to an end, but there may be extras at the end of it. If you’d still like to join, be sure to get in touch with Keyhive!